In honor of National Grilled Cheese Sandwich Day today I knew I had to make grilled cheese. Ok, well I cheat, I make "toasted cheese." Doesn't sound as good but it's definitely healthier! No frying in butter! Tastes just as good to me and less mess to clean up! I searched Pinterest and found two recipes I liked and adapted my version from them. One was from Your Homebased Mom and the other from Food Doodles. It looks like a lot, but I promise it's easy and you probably have most of the ingredients on hand already! Add all your ingredients together and mix thoroughly into a medium saucepan. The white blob is just coconut oil, don't freak out! Bring to a boil and then simmer for about 10-15 minutes. Let it sit until it's cool enough to put into your blender. You can also use a food processor or an immersion blender. Pour it into your blender, carefully! Blend until smooth! Anyone know why it turns orange? This is when I added the tomato paste because I didn't think it was thick enough and the flavor wasn't where I wanted it, but obviously it's better to add it all from the beginning! Return to the saucepan or serve this way. At this point I added milk and water until I got the consistency that I wanted. Get your grilled (er, toasted) cheese going! Mmm look at that melty cheese! Once it's the way you want it, serve it and enjoy! Garnish with a little fresh or dried basil for that perfect finishing touch! Or cut it into tiny bit-size pieces like me. Hope you go for this before buying Campbell's again! I promise, this is way better, and healthier!! Do you prefer to make your own tomato soup or go for the can? What's your favorite way to make a grilled cheese? How did you celebrate National Grilled Cheese Sandwich Day? 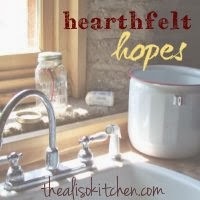 I've linked up to Hearthfelt Hopes #5 with The Aliso Kitchen! 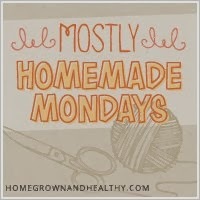 I've linked up to Make Your Own Mondays 9/23 with Nourishing Treasures! 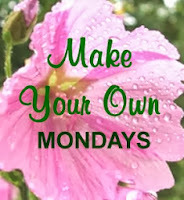 I've linked up to Mostly Homemade Mondays #47 with Frugal By Choice, Cheap by Necessity, Homegrown & Healthy, Scratch Mommy, and Mindful Mama. Adding Ground Flax to Bulk Your Bread! Cook: Kettle Corn the Healthy Way! DIY: Make Your Own Make-Up!